This is a command-line compiler. Click here for an IDE compiler with Editor/Debugger. 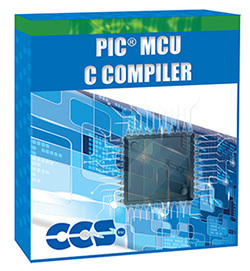 PCD Command-line C Compiler for Microchip PIC® MCUs offers pro-level optimization and includes an extensive library of built-in functions, pre-processor commands, and ready-to-run example programs to quickly jump-start any project. All compilers allow 1, 8, 16 and 32-bit Integer Types, 32-bit Floating Point, Bit Arrays and Fixed Point Decimal. Use assembly code to reference C variables or insert at any location of your program. Command-line compilers may be run from a DOS prompt or be integrated into MPLAB®, MPLAB® X IDE or other Microchip Third Party environments. CCS compilers are easy to use and quick to learn. For the less experienced programmer, a detailed textbook explaining the C language and how it may be applied to PIC® microcontrollers. For more information on a popular chip within this device family, please view the PIC24EP512GP806 Datasheet.